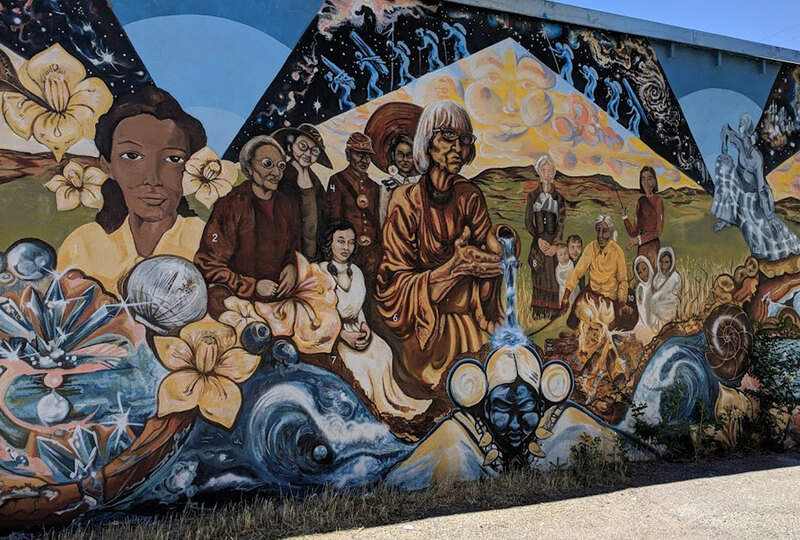 The Women of New Mexico mural honors women chosen for their powerful and positive visions of New Mexico's culture but also for their courage to carry them out, their love for their home and respect for themselves. It creates awareness and provides education for youth because young women in Albuquerque can see the faces of those who helped build a rich foundation in the city. The mural brings these women's journeys to light so they may speak to our city once again. It features artist Pueblita Valarde, Buffalo Soldier Cathay Williams, Soladera Margarita Neri, pottery artist Maria Martinez, surrealist artist Remedieos Varo, New Mexican authors Erna Furgason & her sibling, 1940s Barelas resident Carmen Chavez, and Carrie Tingley of Carrie Tingley Hospital. Izabelle Fernandez Williams is a painter, photographer and activist in Albuquerque, NM. She strives to create movement and change in Albuquerque by creating spaces for unity and togetherness in communities. Al'nair Lara is an agriculture teacher and artist, and Colleen Gorman is a social studies teacher and artist. These two artists were chosen to work on this mural because of their extensive education and love for the arts. They also worked with Young Women United for a mentorship program, where each artist agreed to teach youth about the process of mural art.